DIRECTV Error Codes – 3 Digit Error Code List – How To Reset? DIRECTV showing an error code? There are many different error codes that can show on your TV because of an error with your DIRECTV. 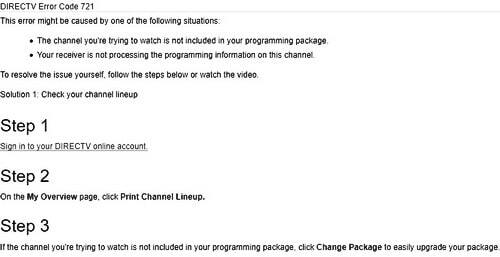 These error codes are a way of informing you of a particular problem or issue with the DIRECTV receiver or the DISH. When an error code is displayed you can write the error code down and use the DIRECTV error code chart below to find out what the error code means. Once you know the meaning of the DIRECTV error code, you can then troubleshoot the receiver box and dish that refers to the error code that is shown on your TV. 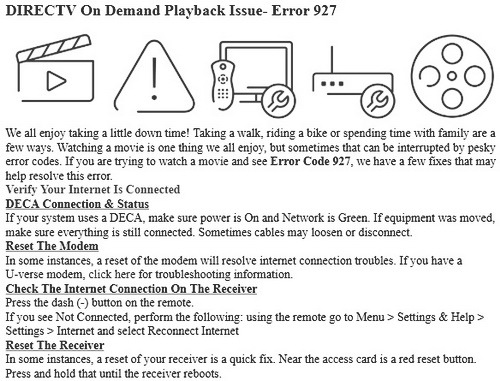 All the DIRECTV error codes are explained below in an easy to read and understand format. NOTE: Many times a DIRECTV error code can be fixed by refreshing or resetting the DIRECTV receiver box. If you’re having any issues with your DIRECTV service, many of the issues can be fixed by restarting your DIRECTV receiver or refreshing your service. You can refresh or reset by pressing the reset button on the receiver or by removing power to the DIRECTV box for 5 minutes. If after trying the reset method you still see the error code, read below for more information on the error code displayed on your TV. Error Code 711 means access Card Is Not Active. Error Code Solution = Customer Service needs to activate. Error Code 721 means Service Isn’t Authorized. Error Code Solution = Customer Service needs to authorize. Can also indicate a blackout condition sports programming. Error Code 722 means Service Expired. Error Code Solution = IRD was unplugged for an extended period reconnect IRD & have Customer Service reauthorize. Error Code 724 means Authorization or Paring Expired Issue. Error Code Solution = Contact DIRECTV to resend Pairing or Resend All Authorizations. Issue may be related to 920 On Screen Display also troubleshoot if present. Error Code 725 means Authorization or Paring Expired Issue. Issue may be related to 920 OSD so also troubleshoot if present. Error Code 726 means Wrong or Missing RID Number. Error Code Solution = Verify RID from TV screen & have Customer Service reauthorize. Error Code 727 means Program Not Available in Your Area. Error Code Solution = Have Customer Service verify address and resend authorizations. 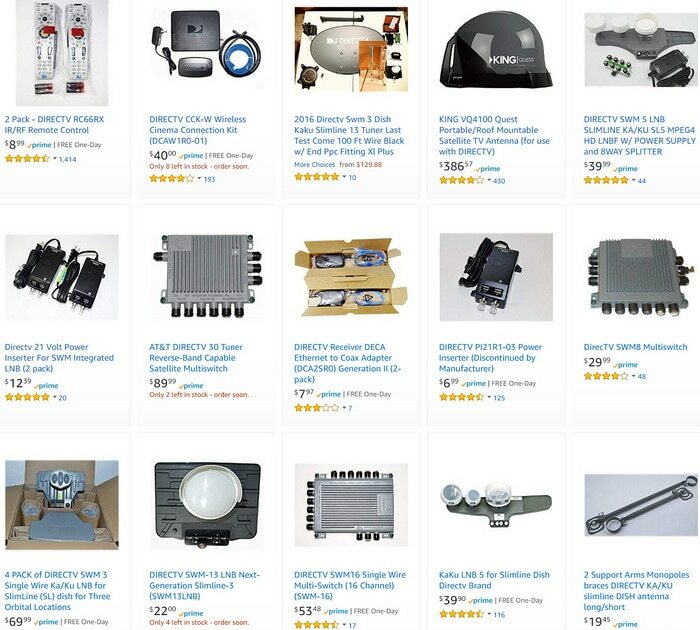 If still not available have Customer Service check for Blackouts or FCC Viewing Restrictions. Error Code 731-743 means IPPV is an option it may not be available for all customers depending on the quality and capacity of phone lines. Error Code 731 means Access Card Full. Error Code Solution = Run IRD system test to make sure phone is OK. If not OK troubleshoot phone line. If OK have Customer Service force a callback time approx 2 minutes. If a forced callback does not succeed see above reminder: For Ext 731-743. Related On Screen Display is 780 for broadband connected boxes. Error Code 732 means IPPV Purchase Limit Reached. Error Code Solution = IRD needs to call to download PPV information. Once it is downloaded the limit will be once again available. Follow procedure for 731 Access Card Full Limits are to protect the customer as well as assure DIRECTV is able to collect on purchase. Related On Screen Display is 781 for broadband connected boxes. Error Code 733 means IPPV Ordering Disabled. Error Code Solution = 60 days with no callback, either resolve callback issue or disable IPPV flag and resend all authorizations. Contact DIRECTV – Related On Screen Display is 777 for broadband connected boxes. Follow procedure for 731- Access Card Full. Error Code 734 means Unable to Request IPPV. Error Code Solution = IPPV flag set to No in the billing system. Error Code 736 means IPPV (Interactive Pay Per View) has been disabled due to STB not successfully completely a callback. Contact DTV – Related On Screen Display is 777 for broadband connected boxes. Error Code 741 means PPV Data was Missing. Error Code Solution = Conflict between your current billing information and authorized services. PPV event day and time needs to be escalated by Customer Service to the DIRECTV Support Center. Error Code 743 means PPV has expired. Error Code Solution = 24 Hour rental period has expired for previously ordered PPV. Error Code 744 means Loss of Programming. Error Code Solution = IRD is not getting authorization. Need to reset IRD and check for new On Screen Display. Error Code 745 means Access Card or Reader may be Defective. Error Code Solution = Access card has had temporary problem processing data. If problem continues IRD and/or access card may need to be replaced. Error Code 746 means Possible Data Corruption. Error Code Solution = IRD had a temporary problem processing data. Error Code 747 means Unable to Complete On Screen Display when ordering or viewing PPV. Error Code Solution = On Screen Display says Unable to complete this transaction. Have Customer Service resend authorizations, then reset IRD Only on NDS IRDs such as D10s, H20s, R15s. Error Code 749 means Multiswitch Problem. Error Code Solution = Troubleshoot multiswitch. Error Code 750 means Service Not Active. Error Code Solution = Customer needs to have HD access to be able to view OTA channels. Error Code 751 means Wrong or Missing RID Number. Error Code Solution = Contact DIRECTV to verify actual RID against Billing System. Error Code 752 means Information Update Error IRD cannot accept a software download or new data updates with the current access card. Error Code Solution = On Screen Display may appear when access cards are being re-paired with IRDs. Error Code 761 means Insert Your Card or MRR Service. Error Code Solution = Access card isn’t all the way in the IRD. Error Code 761 means Insert Valid Card or MRR Service. Error Code Solution = IRD & access card are not communicating. Error Code 763 means Access Card Expired. Error Code Solution = Access card is an older version card. 4) Replace IRD. When troubleshooting this issue tune to channel 377 to verify if programming has returned. Error Code 764 means Wrong Access Card Inserted Access card in IRD does not match what is listed with authorization system. Error Code Solution = Have CS verify & update information. Have CS reauthorize and then reset IRD. Error Code 765 means Please insert your new access card. Error Code Solution = Insert new access card. Error Code 771 means that the DIRECTV receiver is having issues communicating with the satellite dish. Error Code Solution = If you are experiencing heavy rain or snow, simply wait for it to be over before troubleshooting as the signal between your dish and the satellite may be temporarily lost as a result of strong weather. Also, check to see that nothing is blocking the line of sight from the DIRECTV dish and the dish is pointed in the correct direction. Error Code 771A means Problem Communicating with Dish. Error Code Solution = SWiM power inserter may need to be plugged in. The network can’t detect the SWiM due to power loss to the SWiM. No SWiM installation is present Superseded by 775. Error Code 771B means Problem Communicating wish Dish. Error Code Solution = Too many receivers or tuners are connected to the SWiM. Test with SWiM meter and upgrade to SWiM 16 if necessary. Error Code 772 means No guide data. Error Code Solution = Signal or broadcast issue. Occasionally seen after rain fade. Error Code 775 means the DIRECTV receiver is having trouble communicating with your satellite dish and the TV signal may be interrupted. Error Code Solution = Cables may be loose. 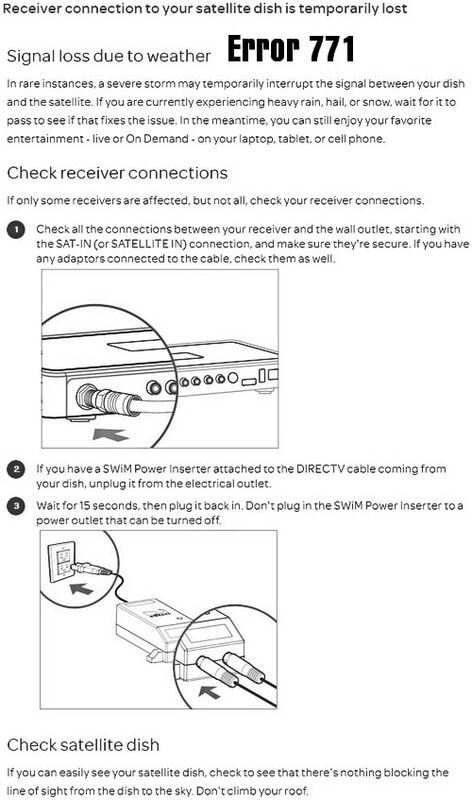 Check the connections on the back of your DIRECTV receiver and start with the SATELLITE IN connection and make sure they aare not loose. The power inserter is the grey or black box that powers your dish. The most common problems is intentionally unplugging it. Error Code 776 means Problem Communicating with Dish. Test with SWiM meter and upgrade to SWiM if necessary. Error Code 777 means IPPV Ordering Disabled. Follow procedure for 731 Access Card Full. Error Code 780 means Access Card Full. Error Code Solution = Run IRD system test to make sure network is OK. If not OK, troubleshoot network line. If OK have Customer Service force a callback est time approx. 2 minutes. Error Code 781 means IPPV Purchase Limit Reached. Error Code 792 means Antenna Problem. Error Code Solution = Loss of signal from over-the-air antenna. Error Code 799 means Replace Receiver Self-diagnostic On Screen Display. Error Code Solution = On Screen Display says Receiver needs to be replaced. It may NOT need to be replaced. Perform a Factory Default through the IRD menu. Error Code 818 means Unable to Start Network Services. Error Code Solution = Background services for Pay-Per-View and Interactive Services cannot start. Ensure only one router or access point between Genie and ISP network. Error Code 920 means Missing Guide Info. Error Code Solution = Your receiver has not received guide information from the satellite for the past 3-13 hours. This is normally a signal issue and often occurs because the customer cannot get the 119 signal. The installation needs to be inspected for the root cause as to why the IRD is receiving this. Error code 927 indicates that an error occurred during the processing of downloaded On Demand movies or shows. Error Code Solution = DELETE the recording and try downloading it again. These error codes mean your DIRECTV receiver is having an issue ordering for DIRECTV Cinema or Pay Per View with your DIRECTV remote control. This video shows ways to order AND how to troubleshoot when ordering with your DIRECTV remote control. Next post: LG Refrigerator Error Code 22 – How To Fix?